Below are pictures of a signature quilt that was done in 1896 by the Sodus Point Methodist Church. 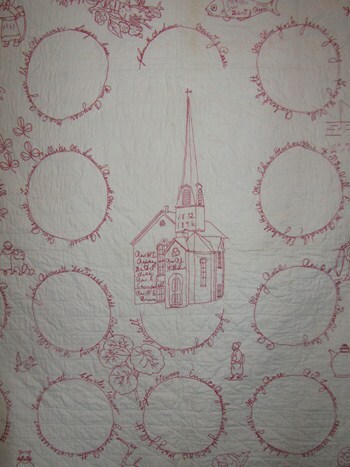 In the 1850’s through the 1890’s churches in the area often did a Signature Quilt as a fund-raiser for mission work or to commemorate a special occassion. If the quilt was done as a fund-raiser, each individual may have had to pay $.10 to have their signature on the quilt. It may have been raffled off also to earn money and consequently given to one winning household. This Sodus Point Methodist Church quilt ended up in the Buys’ family and being passed down from generation to generation. The invention and availability of a pen (abt. 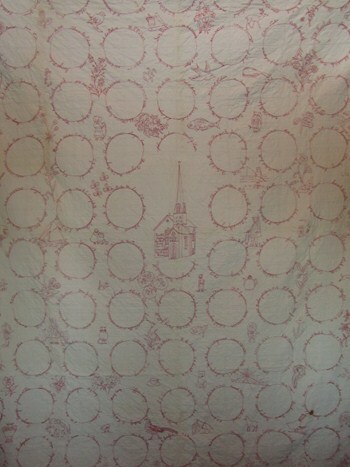 1840’s) that would write on fabric made it possible for individuals to sign their names and later someone embroider over this print. These quilts were done on unbleached muslin and embroidered with red thread. The names were signed 4 around each approximately 6 inch diameter circle. The center of the quilt has embroidered the Sodus Point Methodist Church with the dates: 1872 and 1896. Presuming the church started in 1872 and the quilt was done in 1896. There are also 5 (minister) names: Rev. W.E. Rippey, Dr. B. I. Ives, Rev. G. E. Campbell, Rev. P.E. Brown, Rev. P. J. Williams. In between the uniform circles of names there are neatly embroidered, all in the same red thread, little pictures of animals, birds, flowers and children. The 4 outer edges are done in half circles with only 2 names on each. The attached list of approximately 350 names taken from the Sodus Point Methodist Church quilt done in 1896 may have some errors due to the difficulty distinguishing each embroidered letter of each signature. Also, note that on the attached list of names any information in parenthesis has been added. 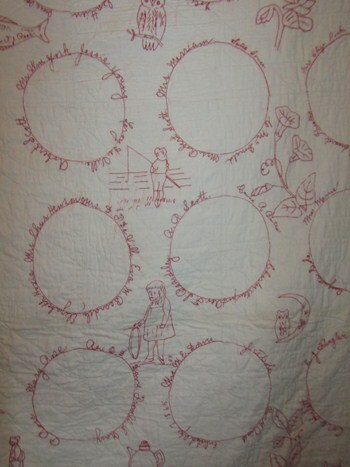 The quilt only included the names and information that is not in parenthesis. The attached list has been alphabatized; whereas, on the quilt , they are not. On the quilt, the names are sometimes done with families together; other times they appear to be random. By referencing the 1880, 1892, 1900 census and the history of the Sodus Point Methodist Church., some notations can be made. Some of these people were first generation immigrants born in such countries as: Canada, England, Germany, Ireland and Holland. Some were black people. Some were descendents of freed black slaves. Some were laborers or servants living in other family households. Some of the occupations were: grocers, blacksmith, farmers, shipbuilders, sailors, fishermen, carpenters and housekeepers. It appears that some of the names are of deceased family members; such as: teenagers, Jay Davis and Fred Fisher, who died tragically in 1894. (1) This would have been two years before the quilt was done. Some were children’s names, included with their parents. One example of this is Grace and Clyde Sutton were 14 and 12 years old in 1896. Their parents were Charles and Lizzie (Elizabeth) Sutton. Some names are followed by Civil War service dates of discharge or enlistment or wounded. 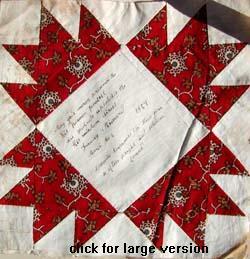 The membership list included in this booklet, has some of the same names as on the quilt, but not all. 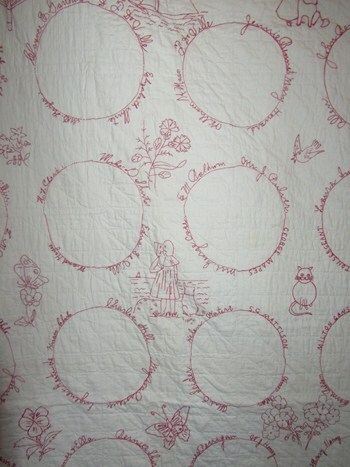 Therefore, it is believed the quilt has names of others from the community; other family, friends or household members. Most names appear to be of people residing in Sodus Point at this time. However, Mrs. C.C. Markell has embroidered “all of Newark” after her name. Perhaps they were from Newark; presently living in Sodus Point or were just seasonal residents. Some of the long-time Sodus Point names noted on the quilt are: Andrews, Baldwin, Bayless, Bennett, Button, Buys, Case, Clark, DeVille (or spelled DoVille), Emery, Ewing, Featherly, Fisher, Flagler, Garlock, Gaylord, Hewson, Hollister, Jones, LeFebvre, Lepper, Lewis, Lyman, Newport, Philo, Preston, Proseus, Rayner, Sentell, Sergeant, Shirts, Sutton, York. Footnote (1) From the booklet, History of the Sodus Point Methodist Church, by Gordon McKee Williams, 1971, page 12. Scott, A.R. (could be Alonzo R.
Finch, Mr. Edward J. or S.? There are two distinct kinds of autograph quilts. Single pattern quilts are often referred to as “friendship quilts” while the more formal quilts made of different blocks are called sampler album quilts. Although both carried on the same tradition of signed remembrances, they were quite different. Sampler album quilts were made up of several unique intricately pieced or appliquéd blocks. A friendship quilt was usually made of several blocks from the same pattern. These blocks could be quickly made from fabric scraps. Most 19th century signatures were written with indelible ink while in the 20th century they were often embroidered. Occasionally one person chosen for her beautiful handwriting would inscribe all the signatures. Some regional signature quilts were inscribed in the fraktur calligraphy used to document important events by the Pennsylvania Germans. Not all signature quilts were friendship quilts. Some were made to raise funds for various causes from missionary work to supporting troops during a war. The finished quilt may have been auctioned off or people may have paid a fee, often ten cents, to have their name placed on a block in the quilt.